The visit on sunday is Prime Minister Modi’s first visit to the state after the Telugu Desam Party (TDP) snapped ties with the Bharatiya Janata Party(BJP)-led NDA a year ago over the Special Category Status and other bifurcation promises. One of the hoardings protesting his arrival shows PM Modi running with a large number of angry people chasing him down while, in the other, he can be seen hanging his head. The crowd has been displayed in the shape of Andhra Pradesh’s map, alluding to the anguish of the state against the Centre. Though no political party has taken responsibility for the act, TDP National Spokesperson Dinakar Lanka said that billboards indicate the anger of the Andhra Pradesh’s people. Meanwhile, BJP demanded police action against the people who have put up the billboards. Police said that they have ordered the municipal authorities to remove the ‘obejectionable’ hoardings, adding they are probing the matter to find out the motive behind the act. Besides billboards, black balloons also appeared at several places in the state to protest against PM’s visit. On Saturday, criticising PMO’s intervention in the Rafale deal, Andhra Pradesh Chief Minister Chandrababu Naidu said his party will do a peaceful “Gandhian” protest. “PMO’s intervention in Rafale deal is a disrespect to the nation. We will do a peaceful Gandhian protest with yellow and black shirts and balloons,” he had said, reported news agency ANI. Prime Minister Modi will be addressing a public rally ‘Praja Chaitanya Sabha’ in Guntur on Sunday, kick-starting the election campaign for the upcoming Lok Sabha polls. On Friday, the Prime Minister faced similar rage in Assam as he was shown black flag when his convoy passed from Lokapriya Gopinath Bordoloi International Airport to Raj Bhavan in Guwahati. Some of the people also shouted ‘Go Back, Go Back’ slogans. The Prime Minister received an unpleasant welcome in Tamil Nadu too when he reached there for laying the foundation stone for the All India Institute of Medical Sciences (AIIMS) at Thoppur a few weeks ago. 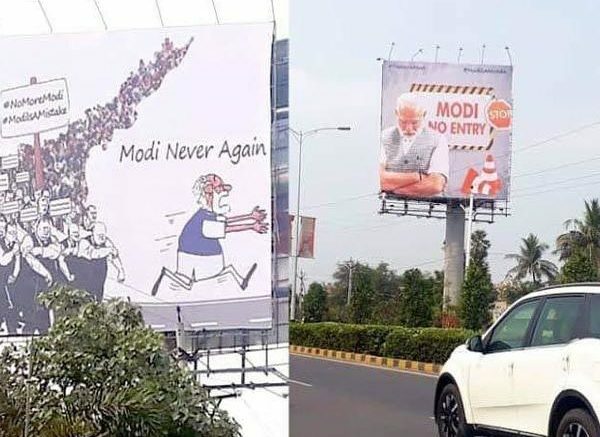 Be the first to comment on "“Modi no entry”, “Modi never again” posters appear in Andhra Pradesh ahead of PM’s visit"